I think I'll start a new thread about the NHW10 "Sticks". They are quite different from the NHW11 and NHW20 cells; they might be better for many applications! Considering that the first post in this thread recommends not to buy anything other than NHW20 cells, it would be a bit of a waste to patch many test results onto the far end of the thread! So far, I have not found a stick which cannot produce 100A for a short time, or has less than 6Ah capacity at 6.5A. Some have cells that get hotter than others during initial charging and during discharging at high currents (60A or so). Have a look around on that NZ website, there are other pages with useful information. The writer of this post accepts no responsibility or liability resulting from attempts to repeat or perform the procedures described in this post. This information may be used at your own risk. I have a full Prius gen II factory packed that I use to power a 16' boat. We won the Wye river marathon in 5 hours and 20 some minutes--24 miles. I use an MRC Superbrain 989 to charge the pack, 24 cells at a time. The MRC under its NiMH program doesn't fully charge the first time around. Or the second. Perhaps the third. I'm not good at recording religiously all the data, but the batteries are hardy. After the MRC goes to trickle, I move on to the next 24 cells. Forgot the mAh for the first two sequence of charges, but round three averages 1800mAh, round four 1400 mAh, and only at round four do I feel warming of the cells. For the marathon, I ran the voltage down from 230 to 160. I kept the amps right around 2 throughout. A MeanWell switching power supply drops the volts to 27 to power a 24v MinnKota. I had for backup and relief a pair of walmart batteries; probably the Prius pack delivered for 3.5 hours, walmart 2 hours. Pushing water aside and fighting 15knots of headwind was tough. Prius packs power. what would be the number of cells I would need ? I figured this by say that 220AH on SLA is 132AH true AH capacity at 60% discharge. Each prius pack will give up about 5AH. So you need 26 to equal 132AH. THis is conservative. With many packs in parallel you will have less Peukurts Effect. So you effective AH range could be 104AH at worst to 171AH which is very unlikely. So 26 parallel for 132AH times 7 cells series equals 182 prius cells. Under a 10C load thats 1320A you could pull. Most light weight EV pull 2-300A. Each cell would see a 2C load or about 11A. Which is barely 1/4 of the rated discharge these cells could handle. How many cells in a standard prius pack ? Electrons are fun to play with... there are so many of them and they are SO responsive! I recently bought 11 cells off of ebay untest for the paltry sum of $27.50 shipped. When they arrived, I was pleasantly surprised to find that 8 of them were holding a recoverable voltage (4.9V+). I took the a battery with a moderately high voltage (7.2V) and immediately started peak charging it with my battery charger- An Integy Indi racing charger for Remote Controlled vehicles. I taped the temp sensor to the side of the pack, and started the charge at 6 amps...later the battery isn't even warm, but the pack is bulging badly and is still charging at 9V! I decided to take a trip to Radio Shack and bought an LM317 and constructed a simple circuit that brought 12V down to 8.3V...didn't work too well, almost toasted the chip. Such a design is past my knowledge offhand. With lack of better to do, I called up the guy on eBay I bought them from. He lives 3 or so hours away from me, and rebuilds and reconditions Prius packs for a living. From what I have read, it's not advisable to mix cells in a traction pack for the Prius, so it seems logical that some of the cells I bought had to be good. The guy in charge told me to buy a hobby grade R/C charger, and I told him my back story of how I had tried that and the pack bulged badly. He then told me that the Prius batteries were very tightly clamped together in the traction pack to prevent bulging, and that the bulging was gas buildup in the pack that caused the charger to mispeak. 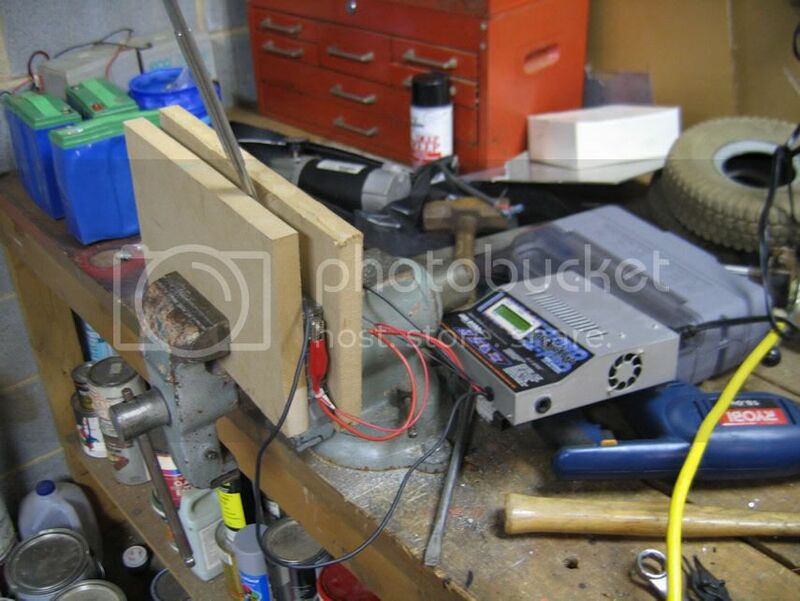 I clamped one cell between two pieces of MDF in a bench vice, and off I went again. I set the peak detection at the minimalist setting (1mV, 6mV peak to peak) and started charging at a very low rate of 0.5A. A few hours later, the charger indicated a promising 2.5Ah or so of charge! I have set the charger to cycle at a 1A discharge rate and a three stage rate of charge all under 0.8A to cycle 9 times. It will probably take a few days, but I will make an update when it gets done with the hopes of a more usable Ah rating. Today, I did the final testing on the first cell. I ended up with a capacity of around ~2600 mah after 3 or so cycles at a low charge and discharge rate. I decided to put the battery to a test, so I did a few cycles at 6A charge and 20A discharge. The good news is that the battery never got hotter than 88 degrees during these tests, and held a discharge capacity of around 2200 mah with a 20A discharge rate the whole time. My batteries may be used and of diminished capacity, but the very low Peukert effect of these batteries are promising for Ebikes. I may be able to get 4 miles or so out of such a low capacity battery, or use it as a racing battery. As soon as I took the first battery out of the vice, It balooned like the first battery did. I do not see this as a problem; the battery deflated after an hour or so to it's original size. I believe that the final battery setup will involve placing the batteries in a tight container to prevent them from overcharging. When it comes to charging, the only solution I have thought of that is not buying 5 of these chargers ( ) involves using one lm200c per battery set at an 8.3v output to charge these batteries. Once I test these batteries in real time I will buy the parts to make one of these chargers. I am still in the process of cycling all the cells to find 5 of them with close enough capacity to each other to use in a 5S pack. They provide promising results at a 25 amp discharge, though. I'm a tad busy at the moment (assuming you were talking about me) but I definately plan to use them in some form or fashion when I get the time. sorry about the vid quality going through the trees, but if you listen at this point, you can hear the 5305 pulling on strong. 112V, 49A, around 5,500 Watts. High Tom-D, thanks for your video and feedback. Can you tell me please, what sort of weight are you pulling behind the bike? Is that a 9C set up? What's the chemistry of your pack? Volt, I have a whole gen III Prius battery pack on-board: 7 modules = 48V block. One block is in the black box and (3) blocks are on the Bob trailer = 28 modules total. I would guess that the weight in the Bob trailer is about 3 * 14 lbs = 42 lbs. The Bob trailer has a max capacity of 70lbs. The motor is a Clyte 5305. High reliability and life. Toyota warrants them for 8 years, 100,000 miles. 10/150,000 in California. Form factor: the 6 cell modules can be easily made up into bricks, reusing the original module connectors. Toyota has already ruggedized the batteries. Weight was not so much a factor to me as life and reliability, solid connections, and ability to dump amps when asked. These NiMH batteries have come way down in price, because there are alot of them around, and it is a buyers market. LYEN programable EC124115 controller ROCKS! Regen braking is great assist for the hills. Anyway, I have migrated from SLA, to A123 with Voltfreaks, A123 with twitchy F/G BMS all BLECHH !! I wanted REAL EV power, no BMS to mess with. YEARS of reliable service. I sought out reliability and I found it with the Prius. (The parallel discharging and parallel charging idea was inspired by Justin's ride across Canada) Thanks Justin ! okay Tom, thanks for that, thanks for the feedback. Just one more question.....is that full throttle, or half-throttle, etc?? The Mighty Volt wrote: okay Tom, thanks for that, thanks for the feedback. Volt, the idea is to keep the hub motor in the efficient range while climbing hills. Any more throttle than necessary is a waste and turns to heat in the motor and controller. IMO, the worst thing you can do is to start going up lugging the motor and never get it to spin up. The best trade off is to get into the motor's efficient range, and then back off when you start to loose efficiency. I go by the sound of the motor. Probably another topic, but there is an art to it. I have purchased 22 of the bad cells from the same eBay auction. I am still not really sure how to charge them. Since I have read on here that standard NiMH chargers "miss the Delta v" (I have no clue what that means) that a CV charger is to be used. I checked all my power supplies and found one that has an output of about 8 volts (even though it is marked 3.7v on the power supply) with only 370 mA output. I am hoping this is weak enough to use without damaging a cell. Is that a correct assumption? I took the lowest voltage cell of the 22 at 4.25v and charged it with the above mentioned power supply for half an hour. After letting it sit for 7 hours, the voltage showed 6.38v. I have put it back on the charger for 2 hours, and it is showing a voltage of 7.80v while charging. Temperature is still cold to the touch. Will using such a small power supply damage the cells? Will it take too long to charge? When do I know when to stop? What are the next winning lotto numbers? vpoppv wrote: I have purchased 22 of the bad cells from the same eBay auction. I am still not really sure how to charge them. Since I have read on here that standard NiMH chargers "miss the Delta v" (I have no clue what that means) that a CV charger is to be used. I checked all my power supplies and found one that has an output of about 8 volts (even though it is marked 3.7v on the power supply) with only 370 mA output. I am hoping this is weak enough to use without damaging a cell. Is that a correct assumption? I took the lowest voltage cell of the 22 at 4.25v and charged it with the above mentioned power supply for half an hour. After letting it sit for 7 hours, the voltage showed 6.38v. I have put it back on the charger for 2 hours, and it is showing a voltage of 7.80v while charging. Temperature is still cold to the touch. Will using such a small power supply damage the cells? Will it take too long to charge? When do I know when to stop? What are the next winning lotto numbers? Welcome to our obsession, vpoppv! You cannot hurt these batteries with a small power supply, as long as you don't exceed the charge voltage=8.2V per module. They can be charged up to 1C, or around 6A. What you want to do is exercise them, by discharging them down to around 6.5V/module. Then, charge them back up. Do this 3-4 times for each module. When you define what voltage you want to use them at, then series them up and make yourself some bricks, alternating the + and - terminals and taking advantage of their nibs and recesses to construct them together. Then, get a cc/cv charger that will have a CV of 8.2V/module total. So for example, a 7 module brick = 7*8.2 = 57.4V. Some chargers allow an adjustment to reach the target cut-off. Then, the entire brick can be discharged and charged as a pack to the desired voltage for your usage. These batts can be discharged up to 10C (like 65A), per powermed's OP. It is good that your lowest voltage module is possibly showing no bad cells. These dormant modules need to be exercised to get their performance back up. I know you are new to this, so I''ll try to make it easy. The single gray module contains 6 individual cells in series. Each Nihm cell can handle more or less 1.4Volts. 6 x 1.4V = 8.4V. But understand, that the voltage for NimH is just an approximation for state of charge (SOC). Toyota rates the module at 7.2 V, and in my own bench tests, the maximum you want to charge each module is 8.2V. Others folks have charged 8.3, 8.4 8.5 8.6 and so on, but they are getting conditions of off-gassing and swelling of the modules. Now, I have done this,too, it has caused a trip or 2 to the battery recycle bin. So, please beware of charging past 8.2V/module. What you are describing to yield a 14.4V pack is 2 modules in series or a 12s. If you want to put 2 of these in parallel, it would be a 12s2p. If you wanted to charge with a 12V charger in this configuration, then go for it. But, you are WAY undercharging and you will not get the amp hour capacity(AH) they would otherwise hold. The Prius batteries do not hold 6.5AH, it is more like 4AH before the voltage sag becomes noticable. True, Toyota never intended to charge up to 100% SOC, but I have done 100's of charges up to 8.2V/module, with no temp rise and no swelling. So, for their weight, better to fillum up to a safe top to go further. There is no sulfation like in lead acid batteries because there is no sulfuric acid. The electrolyte used in the Prius is potassium hydroxide. vpoppv wrote: So far, I have two cells out of eight that won't hold anything over 6.6 volts. Again, you are referring to modules as "cells". Cells are the smaller units within the modules. There are 6 cells in one module. The connectors between modules are short copper strips with 2 holes, each fitting over 2 posts and secured by 2 nuts. Finding original connectors is the easiest route to go. Ask the seller of the modules if they will include in a purchase. They have no other use to a seller. If you are in a pinch, just fabricate from copper strips and drill 2 holes in them. I have used pieces cut from a copper water pipe, then flatten and drill. You can make a jig from steel to sandwich the copper between when drilling. Then, make a short "production run" to have as many as you need. Necessity is the mother of invention. The connectors are definitely NOT one long strip for each terminal. . They are only long enough to connect the + and - of each alternating module in series. I just purchased 11 modules also. I had 5 arrive @ 2.5v and 2 @ 3.5. I am charging them with a 5v 4a PS atm. Then I plan on doing series pairs with the 16v 4.5a IBM chargers. What should I look for to see if they survived. Also what (hopefully fairly inexpencive) testing equipment should I get to test aH ratings and such? Just getting into this stuff, picked up a free "Giant" MB off craigslist with a bent front rim that will be my learning platform. So probably a front hub motor to start with. cancerkazoo wrote: I just purchased 11 modules also. I had 5 arrive @ 2.5v and 2 @ 3.5. I am charging them with a 5v 4a PS atm. Then I plan on doing series pairs with the 16v 4.5a IBM chargers. cancerkazoo, The modules need to get over 8V (off the charger) to be good. You also need to discharge them to around 6V to exercise them. If they stay as low as 2.5V or 3.5V, they are bad. Using IBM chargers with 2 modules in series should work, but watch if you go over 8.2V/module. I have had them swell, which turns them to junk. You might want to get a watts up meter to measure AH. I was just thinking I should get them to a common voltage before I charged them in 2s config to 8.2v. Is the off gassing very loud or do I have to listen closely to hear it? I also bought a 24v 5a Meanwell PSU for 3s charging. I'll check into a watts up meter also, thanks. Steve, I would just take 2 modules in series (12s) and put the 16V charger to them and see if they get up to 8V/module. If the voltage gets too high, they will swell way before any off-gassing. If you limit the voltage to 8.2V/module, they won't give you any problems heating up, swelling or gassing. For 3 modules in series(18s), limit the Meanwell to 3 x 8.2 = 24.6V and you will be fine. These batteries will benefit by cycling for 3-4 times at first. They will all self-discharge to a point. This is normal for them. Just thought I would post my experience with a recent set of Prius batteries. I am using a set of 6 modules. The are from a 2004 or newer vehicle and measured 7.4 volts or better each when they arrived from ebay. I have been charging them with computer packs wired in series to give me some 53 volts no load. When I connect them to the prius pack the packs are giving approximatly 3.5 amps and gradually reduce to 2 or so as the pack charges. I am letting the pack charge until the voltage at the battery reads 49.6 or so then unplug. I wait until the surface charge eases off and usually get a resting voltage of 49.2 or 8.2 volts per module. Each module has measured within a tenth of a volt of each other after each charge cycle. Usually (this is only my 3rd charge cycle) the pack reads 44 or so when I go to charge it up. The good news is this pack has pushed me (260lbs) to speeds of 23-24 mph on flat ground with 2" mountain bike tires. The only time I measured the ground covered was for 3.4 total miles with some moderate hills. I think I could double that if I could quit twisting the throttle all the way. I finally found the third IBM laptop power pack rated at 16v so I can connect each one to each two prius modules. Now I only have a ~15 minute recharge time. I Still have to watch the voltage meter to prevent overcharging. I was also able to improve my distance traveled to 5.25 miles (from 4.3) by trying to keep my speed (10-15mph) down and using the regen for slowing on hills and doing some very minor pedaling. Motor spokes are starting to get noisy. Guess I need to snug them up.